You’ve never seen the Bible like this before. That is, if you can actually see this version. 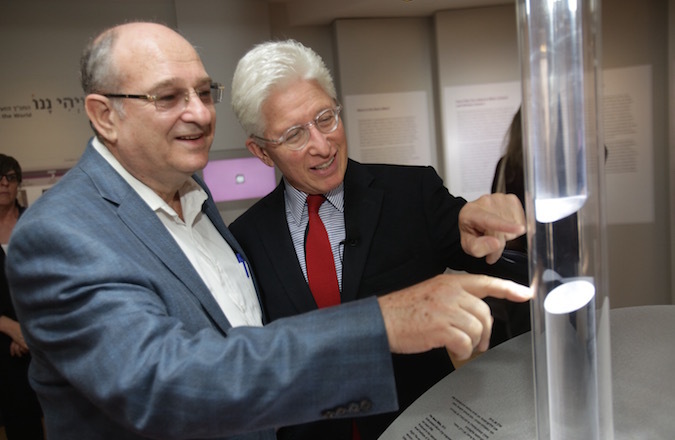 For the 50th anniversary of the Shrine of the Book wing of the Israel Museum, which houses the Dead Sea Scrolls, the museum has launched an exhibition on the “nano bible,” or the world’s smallest Bible, created by Israeli scientists at the Technion. The Nano Bible, which is engraved onto a 0.5 mm2 chip and is barely visible – a Technion description compares it to the size of a grain of sugar – was first produced back in 2009, when one of the first copies was given to Pope Benedict XVI on his trip to Israel. This Bible, conceived by Uri Sivan and Ohad Zohar of the Russell Berrie Nanotechnology Institute at the Technion, is technically an engraving. To produce it, engineers took a wafer of silicon, coated it with a layer of gold less than 100 atoms thick and engraved the text with a focused ion laser beam. Engraving the book’s 1,200,000 Hebrew letters would have been an, ahem, biblical undertaking, so naturally the scientists devised a computer program that allowed the ion beam to inscribe the letters in around an hour and a half. Compare that to the year and a half it can take for a scribe to complete a kosher, hand-lettered Torah scroll. The exhibition, which opened on April 20, runs through the end of next year. A video on Technion’s Facebook page gives more background on the exhibit and its origins.